What Is A Rat Bobber? The Rat Bobber: There are many motorcycles that conjure up special feelings in those that are motorcycle enthusiasts, and most of these motorcycles are expensive to say the least but there is one motorcycle type that brings special emotions to motorcycle enthusiasts even though it is relatively low in price to build. 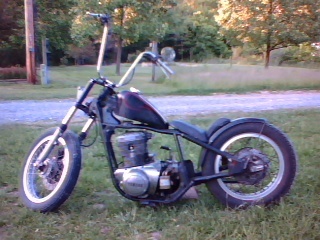 The motorcycle in question is called a Rat Bobber. The Rat Rod Bobber has a long and illustrious history dating back to the early 1940's when the American motorcycle seen was taken over by the Bobber motorcycles. The Bobber motorcycles could be heard from miles around because of the noise they made but turned heads not for the noise they made, but more for the wonderful design of the motorcycle itself. The rat bikes pictured here are more like rat rod choppers than bobbers. The first bike aboveis fairly close to what a rat rod bobber might look like. For more information on rat rod bikes go this page. For more information on the rat bike below click it's picture. The Bobber is a motocycle that has been stripped down and had its design altered to something new and unique, something very close to that of the rat rod today and this is the reason you get the name rat rod bobber because of the close similarities between the bobber and the rat rod motorcycles of today. Well a rat bobber can be explain as a motorcycle that has been stripped of all its accessories such as lights, reflectors and the like then given a stretched frame that is lower to the ground mixed with elongated angled forks and high, angled handlebars. In fact if you were to imagine a stretched cartoon motorcycle your near to understanding what a rat rod bobber looks like. Overall a rat rod bobber is basically a frame with a motor, gas tank, two wheels, forks, handlbar and seat, nothing more than that. In fact many people make their own rat rod bobbers in their workshops at home using all sorts of items from motorcycles to toasters. This unique and original design gives an aesthetic look that makes people take notice as you ride by, it is also a fun ride that you can enjoy in comfort. Even though a rat rod bobber is very primitive in design compared to new motorcycles they actually do capture the imagination of anyone who sees one more than any other motorcycle. If your looking for an interesting and unique motorcycle then why not look at buying a rat rod bobber. 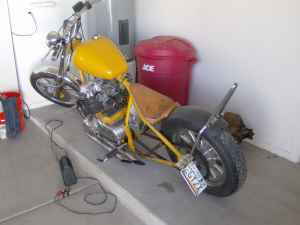 If you are up to the task you could even make your own rat rod bobber project by building one yourself giving you more freedom to make your rat rod bobber exactly how you would want it to look.